Hanley Ramirez is a comedian? Or maybe he's telling the truth. 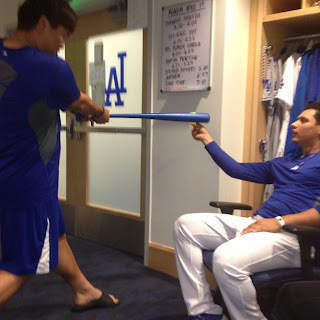 Hyun-jin Ryu picked up three hits last Saturday against the Diamondbacks. Luis Cruz on the other hand is struggling. As of now, he's batting .111 with zero extra base hits. Ryu can teach Cruz a few things I guess.